The campaign to save Earths most threatened tribe has triumphed as Brazil announced that all illegal invaders have been expelled from the Awá territory. In an unprecedented victory in the campaign to save Earth’s most threatened tribe, the Brazilian government has announced that all invaders have now been removed from the Awá indigenous territory in the eastern Amazon rainforest. The news comes exactly two years after Survival International and Hollywood star Colin Firth launched a high-profile international campaign to save the Awá from extinction – setting a new record in the history of Survival and its efforts to protect the land of indigenous tribes. Under unprecedented international pressure, the Brazilian government sent a ground squad of hundreds of agents to remove illegal cattle ranchers and loggers from the land of the Awá in January 2014. After an overflight of the area last week, the Public Prosecutor and Judge working on the case handed the Awá an official document confirming that all non-Indians have now been removed from their territory. The Awá’s land retains some of the last remaining patches of rainforest in the eastern Amazon, despite illegal loggers having destroyed over 30% of the forest in the Awá territory. The Brazilian government sent helicopters, vehicles and a ground squad of hundreds of agents to remove illegal invaders from the Awás forest. 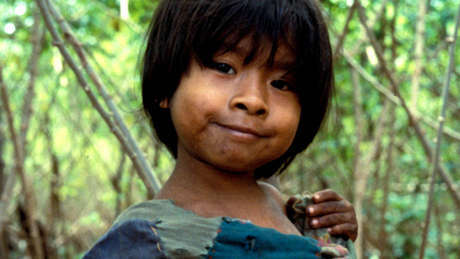 Brazilian experts had warned that the Awá, one of the last nomadic hunter-gatherer tribes in the Amazon, faced extinction if no action was taken. Around 100 Awá remain uncontacted and are particularly vulnerable to diseases brought in by outsiders, which could decimate them. The Awá had made numerous desperate appeals to remove the invaders, many of whom were armed, with a history of violent attacks against the Indians. Dozens of celebrities and hundreds of supporters in 38 countries brandished the awaicon in support of Survivals Awá campaign. - Over 57,000 messages were sent to Brazil’s Minister of Justice asking him to take action to remove the loggers. - Dozens of celebrities, such as renowned Brazilian photographer Sebastião Salgado, Hollywood actress Gillian Anderson, fashion designer Vivienne Westwood, musician Julian Lennon, and many others, pledged their support. 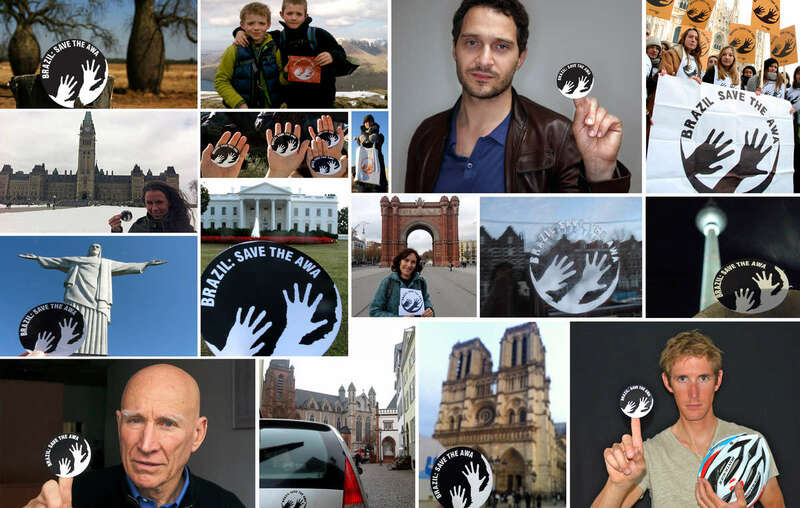 - Hundreds of awáicons – the campaign’s logo – were photographed on famous landmarks in 38 countries. 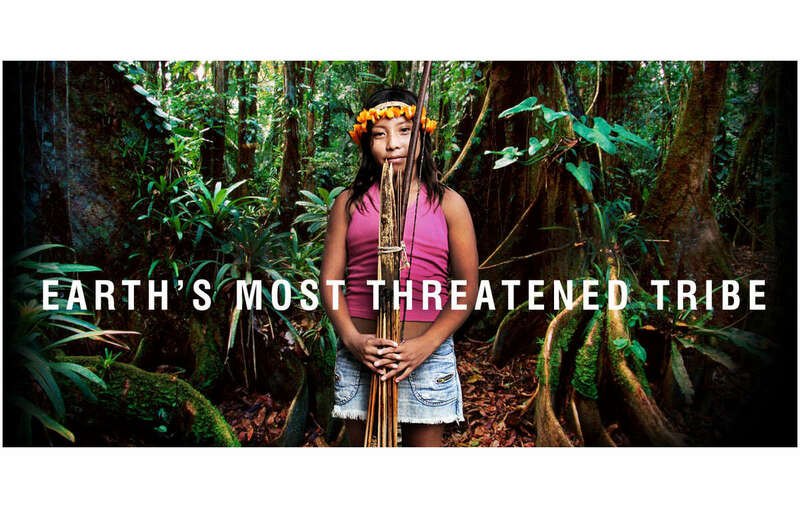 - Three ad campaigns brought the plight of the Awá to the attention of millions around the world. - The Inter-American Commission on Human Rights, the Americas’ top human rights body, took action following an urgent submission by Survival and Brazilian NGO CIMI, which has worked with the Awá for decades. 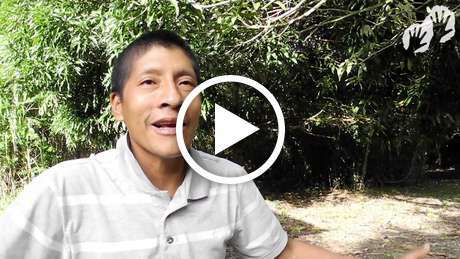 Survival is now calling on the Brazilian authorities to put in place a permanent land protection program to keep the invaders out of the Awá territory. - Other successful campaigns by Survival International include the demarcation of the Yanomami territory in 1992 and the support for Botswana’s Bushmen to live on their ancestral land in the Central Kalahari Game Reserve.